Coming-of-age stories follow certain beats. There’s the walk through school, meeting some eyes and not others, often with a monologue in voice-over introducing us to this young person’s world. There’s an inspirational figure, sometimes two; this person, while flawed, challenges and cherishes the protagonist. There’s often a brief glimpse of childhood, some formative moment—we see the even-younger hero as they meet a future boyfriend, or declare what they’ll be when they grow up, or watch as their parents fight and one drives away for good. There are dances and dust-ups and, ultimately, lessons learned. There is warmth and there is triumph. 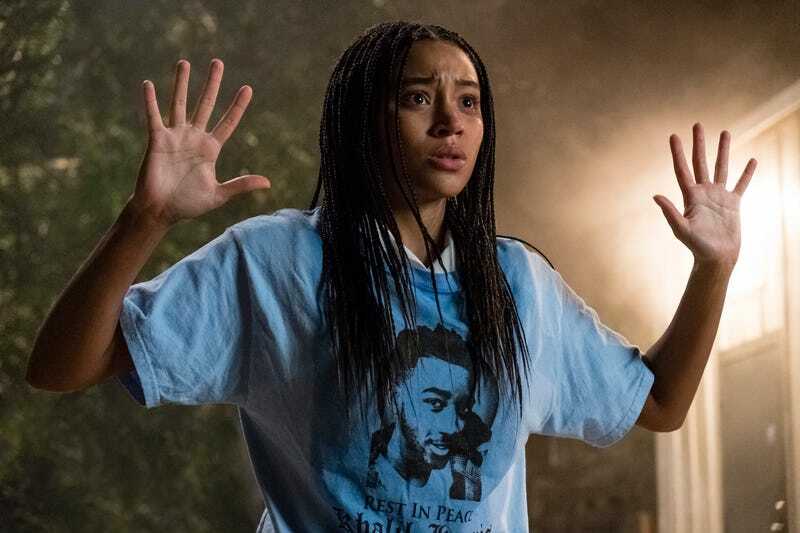 The Hate U Give, adapted by Audrey Wells from Angie Thomas’ bestselling young-adult novel and directed by George Tillman Jr., hits all these beats, but it is far from ordinary or expected. Starr Carter moves through a coming-of-age story, but her high school saga is violently disrupted by another kind of narrative. The comfortable nature of the first makes plain the unspeakable horror of the second; the trauma of the second makes the warmth, and especially the triumph, all the sweeter. That’s not to say that this is two films in one. First Thomas, and now Wells and Tillman, make sure that Starr’s story coheres, despite the shots that ring out. The film opens with a scene from her childhood, referenced but not witnessed in the novel: “Big Mav” Carter (Russell Hornsby) sits his young children down for a lesson, like he’s teaching them to look both ways before crossing the street. He tells them, as his wife (Regina Hall) cradles their baby, to keep their hands on the dashboard, to do whatever the officer says, to know their rights but to be safe. Then he hands them the Black Panther 10-Point Program and tells them to memorize it. There will be a quiz. Years later, Starr (Amandla Stenberg), Seven (Lamar Johnson), and baby Sekani (TJ Wright) remember that conversation. It’s there, percolating in Starr’s memory, as she walks the halls of her predominantly white private high school, code-switching so that “Williamson Starr” will be accepted by her classmates. And it’s easily called to mind when, leaving a party with childhood friend Khalil (Algee Smith), they’re pulled over by a cop. She keeps her hands on the dashboard. Khalil does not. He reaches for a hairbrush, and it costs him his life. This is a film that’s tense from its earliest moments and tragic shortly thereafter, but never does it feel gratuitously punishing. Starr has to keep living her life, and so the audience lives it with her. Nor does it ever become self-serious, because it’s always rooted in this family and those in its orbit. Tillman’s study of the Carters’ life is filled with casual, comfortable detail, a texture that becomes richer when they’re in crisis. Waking up from a nightmare, Starr sees her father; he’s been waiting for the nightmare, he has a trash can ready for the moment she vomits. The framing, the staging, the production design all help to create this texture, but Tillman rightly entrusts the bulk of the storytelling to his uniformly excellent cast. Draw a name from a hat, and that actor does a remarkable job—Karan Kendrick, excellent; Rhonda Johnson Dents, excellent; Dominique Fishback, excellent—but the top-lined cast anchors the film with tremendous grace and thoughtfulness. Hall, Hornsby, Johnson, and Issa Rae all lend the film weight and a quiet, lived-in quality, but much of Tillman’s film rests on Stenberg’s shoulders, and she proves more than equal to the task. Through Stenberg, we watch Starr struggle to juggle two lives; cope when one is turned upside-down; attempt to manage her own trauma, grief, and fear; and ultimately find her footing, her power, and her voice. It’s the kind of performance rightly called brave: simple, emotionally vulnerable, detailed and technical but never showy. When Stenberg’s voice cracks, it’s difficult not to feel the tension in one’s own throat. When she roars, it’s loud as thunder. Tillman’s camera sees Starr, and Seven, and Sekani, and Khalil. As with many adaptations of novels, Tillman and Wells struggle to capture the full arc of the narrative—necessarily condensing things for the sake of simplicity and expedience, but not totally able to compensate for the weight and nuance lost. But they have nevertheless told a vital story centered on the strength, intelligence, compassion, and undeniable power of a young black woman. 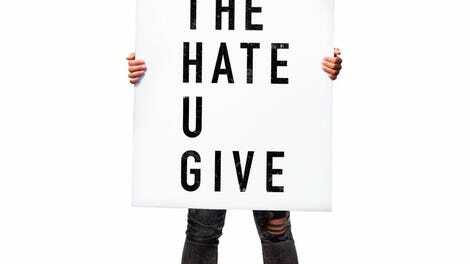 The Hate U Give does right by its source material, star, and subject. Like any good teen movie, it includes triumph—and in many ways, it is one itself. What non-2017 book did you finally read this year?